There's a new hair trend that will take you right back to your Myspace days. 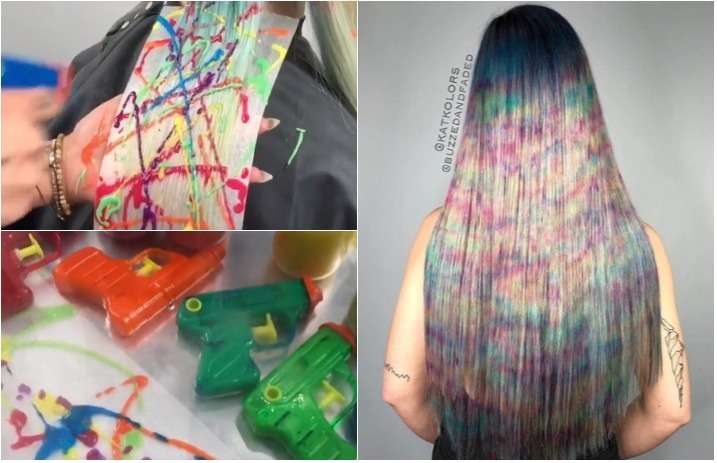 Hair stylists Kat and Andrew Collett (Katcolors and Buzzedandfaded, respectively, on Instagram) decided to join two really fun things: Hair dye and water guns. Yes, that's exactly what you think: They dye people's hair with water guns. The couple, who own With Love Salon in Kansas City, Missouri, fills the guns with hair dye mixed with water and splash it right onto hair. “We were inspired to create something both Andrew and I could fully plan and apply together,” Kat explains to Allure. Yes, we know! The resemblance is uncanny. Check out some videos of Andrew and Kat at work—and maybe schedule an appointment, if you're feeling nostalgic.